Michael Caputo (left) introduces Steve Bannon at the Jamison Road Fire Hall in Elma. With the time to Electon Day starting to be measured in days and hours and not in weeks or months, conservative firebrand Steve Bannon came to town Wednesday to plead for other conservatives to go out to vote and encourage others to vote. The event at the Jamison Road Volunteer Fire Hall in Elma was led by activist Michael Caputo, campaign manager for Republican Assemblymember David DiPietro. A separate fundraiser with Bannon was slated for the Roycroft Inn in East Aurora, but Caputo said threats forced the restaurant to pull out. It was an event filled with vocal conservatives like Bannon, Caputo, Carl Paladino and Erie County Comptroller Stefan Mychajliw. "There's a big fight going on out there. It's a war," Caputo said. "I don't care what anybody tells you, we're at war in this country." Bannon was stronger in attacking progressive activists, saying they have been working like the Tea Party did. "I admit their fight, right? We're not going to hug this out," Bannon said. "We're going to have to fight this out in the ballot box, right? And here's what they fear: they fear that now Trump has now energized people. Trump has now told people that your vote counts, your voice counts. You matter and you matter on Election Day and if you support me, I will have your back." Bannon said progressive activists have worked very hard to win Congress and they don't like the people who were in the fire house for the rally. "Remember, they consider you fascists. They consider you racists, right? They consider you misogynists, right? They consider you homophobes, anti-semites," Bannon said. "They will you call you accusations and I say this time and again, when they are throwing those accusations at you, wear that accusation as a badge of honor." Bannon pointed to the demonstrators across the street, a sign of activism against President Trump. 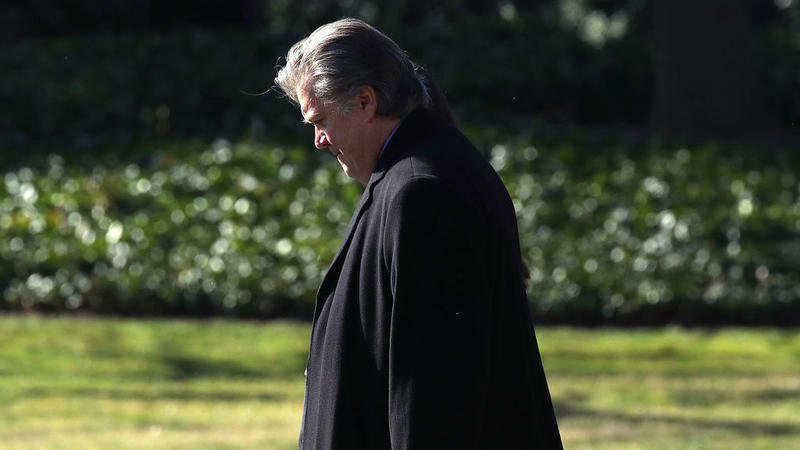 "They've got the energy and the passion, and the problem we had is that people had not focused on the fact that this is a national election, that this is Donald Trump's first re-elect," Bannon said. "And so we started to change that meme. I went on Hannity with, what? 100 days to go and I said, 'Hey, this thing is 35-40 seats. We're starting to close the gap.' And, today, today, we're down to probably 25-30." The former White House official said Republicans will pick up a few seats in the Senate and hold the House of Representatives by one or two seats. Bannon threw out the usual Democratic names to an appreciative crowd. The crowd at the Jamison Road Fire Hall awaits the start of the rally. "If you think that Jerry Nadler and Nancy Pelosi and these guys are going to take over the House of Representatives because they want to work on prison reform with Donald Trump, you are sadly mistaken," he said. "The first thing they're going to do is vote in Mueller's report, right? As a document, set up a select committee, right? With all the killers, with Schiff and Nadler and Maxine Waters and all of 'em, right? And that's going to be the beginning of the impeachment process." Bannon said the impeachment won't succeed, but said it will grind the Trump Administration to a halt and that is the goal. He told the audience activities like the fight over confirmation of Brett Kavanaugh to the U.S. Supreme Court are exciting Republicans and that is why what looked like a Republican massacre in Congress is turning around leading to potential GOP gains in the Senate and barely holding the House. "Nov. 6 is a time you got to make a decision on who you're are going to support," he said. "Is somebody going to support Donald Trump? Every congressional race in this country is a proxy vote. Just like Kavanaugh was a proxy vote. It's a proxy vote on Trump and it's a proxy vote on what your common will says is the direction we should take this country. It's all up for grabs now." Bannon said those in the audience need to call relatives, friends or enemies to get out and vote for President Trump. "I keep saying, I was fortunate enough after I left Harvard to work at Goldmann Sachs, right?" Bannon said. 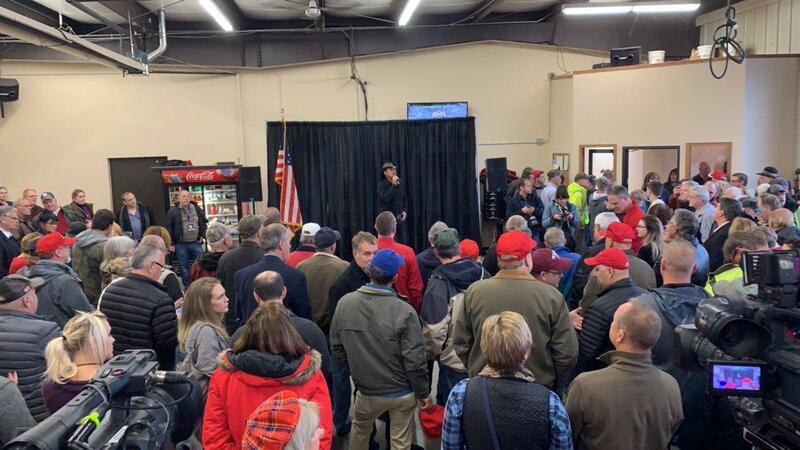 "If you gave me the choice between the first 100 people that showed up here at Jamison fire house today in a red ball cap to govern the country or the top 100 partners at Goldman Sachs, I would take these red ball caps every day." An audience filled with people in red ball caps cheered, shouted and whistled, as Bannon asked them to support the president. One of the architects behind Donald Trump's presidential campaign, Steve Bannon, will be in Elma for a "Get Out the Vote Rally" on Oct. 24 at the Jamison Road Fire Hall. WBFO's Marian Hetherly talked with Political Consultant Michael Caputo, who has been working with Bannon on about 30 close Republican races nationwide this midterm election and said people will start gathering at 4:30 p.m.
Is The Trump Presidency Having a Crisis Moment?